Unless you’re a fish, Sitka is a remarkably peaceful place. But on Dec. 7, 1941 — and in the days and months thereafter – Sitka poised on the brink of world war. Soldiers and sailors scanned Sitka Sound and beyond and manned powerful shoreside batteries to blast enemy ships miles out at sea. Armed spotter planes flew over the Gulf of Alaska, searching for a Japanese fleet expected to invade first Alaska, then the rest of North America. Six months later, the Japanese Navy bombed Dutch Harbor in Western Alaska. They seized the outermost Aleutian Islands, Attu and Kiska. Sitkans could well imagine they were living on the front lines of World War II. Some war historians believe that the Japanese attack on Alaska was purely a diversionary tactic, but not Sitkan Matt Hunter. The U.S. Naval victory at Midway Island in the central Pacific tipped the war heavily toward the U.S., and the Japanese Navy never fully recovered. But, says Hunter, that victory does not make Alaskan fears of Japanese attack groundless. A high school math and physics teacher, Hunter is a lifelong Sitkan. He was born at Mt. Edgecumbe Hospital on Japonski Island, itself first built as a Naval facility. He grew up with rumors of underground hospitals built like downward skyscrapers underneath the Causeway, a string of small islands the Army connected in order to place guns there. By middle school, he rode his bike all around the area, finding pillboxes hidden in the woods. By high school he was working with an archeologist studying old WW II radar facilities atop Harbor Mountain. At the ripe young age of 27, Hunter has become a leading expert in the remains and relics of WWII Sitka, and a tireless advocate for their preservation. He hosts the website www.sitkaww2.com. 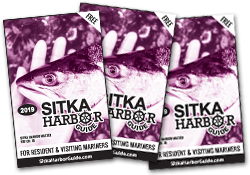 He has given presentations and guided tours to community groups interested in Sitka’s wartime legacy – the Sitka Historical Society, the Sitka Conservation Society, Alaska State Parks, Sitka Trail Works and the Sitka Maritime Heritage Society. The result has been the creation of Alaska’s newest state park, Fort Rousseau State Historical Park. 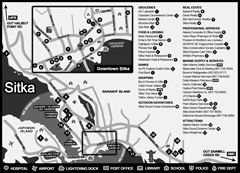 Over several years, before and after Pearl Harbor, a very elaborate coast defense system was developed. 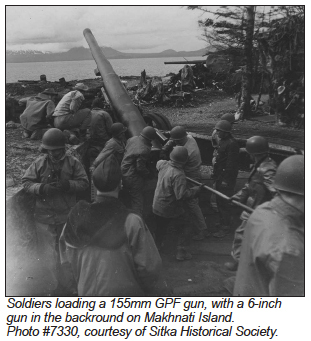 Large guns that could shoot ten or more miles out to sea were deployed around Sitka Sound – Shoal’s Point on Kruzof Island, Biorka Island and on the Causeway. Lookout towers with powerful 60-inch searchlights were placed all around the sound and, by triangulating their sightings, could pinpoint the position of a ship and the speed and direction in which it was moving. This information was relayed to the highly accurate guns, which operated in two-gun batteries. Radar was used to shoot in fog. 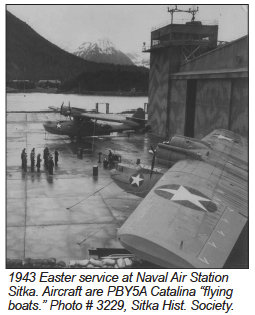 At the height of the preparations, Hunter estimates that up to 8,000 soldiers, sailors and aviators were stationed in Sitka, along with a few hundred private contractors and a contingent of Marines. This, while the population of town was only 2,000. But the big guns never had to be put into action. Determined U.S. resistance in the Aleutians and the U.S. victory at Midway put Sitka beyond Japan’s grasp. 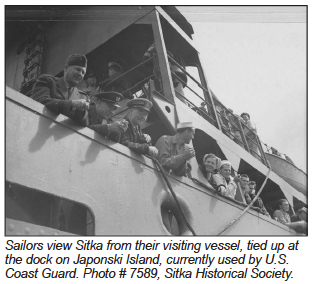 Sitka’s main role for the war became as a trans- shipment base for men and supplies moving to the Aleutians. Still, the big guns pointed out to sea throughout the war. Hunter talked to a veteran living in Mississippi, Cpl. Ted Gutches of Battery A of the 266th Coast Artillery at Shoal’s Point. The corporal had spent a rainy winter in Quonset huts and tents and collecting rainwater to drink. He told Hunter where the guns were located and Hunter went out to look for remains. In fact, Hunter took the long boat trip 10 times before he finally located his prize buried under a foot of sand and spruce cones. Hunter sent photographs of his find to Gutches in Mississippi.